After the Thanksgiving nap is over and the leftovers run out, the next holiday children look forward to is Christmas — a time full of music, decorations and presents. But children aren’t the only ones looking forward to the holiday season, when shoppers flock to the mall to buy gifts for their loved ones. Thieves also look forward to the Christmas shopping frenzy when they can fit into crowds in busy parking lots and look for opportunities for an easy crime. 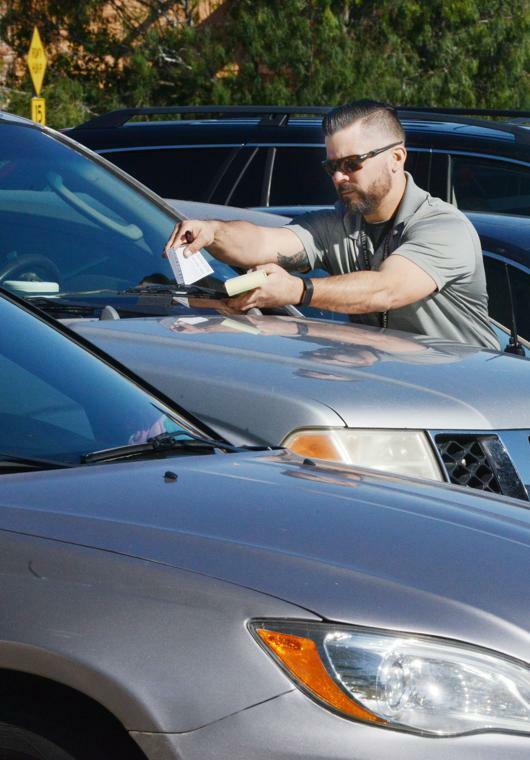 That’s why members of the Brownsville Police Department Auto Theft Division were out in the Sunrise Mall parking lot last week checking vehicles of shoppers to see if they left out valuables in plain view or if they didn’t lock their car doors. “You don’t want to make it easy for a criminal to identify you as a target,” Brownsville Police Department Spokeswoman Melissa Gonzalez said. The Brownsville Police Department wants to remind shoppers to double check that they locked their doors. “The easier access they have, the easier it’s going to be for them to get all that stuff,” Gonzalez said. If shoppers must leave a valuable in their vehicle, they should conceal it. People should also make sure not to leave smart phones on seats in cars because a locked door won’t stop a determined burglar. “I think it’s a crime of opportunity,” Gonzalez said. Last Monday, in about an hour, investigators had checked around 60 vehicles parked outside the Food Court at Sunrise Mall and discovered that ten people had left their doors unlocked. “It just takes a couple of minutes and that can be you as a victim of auto theft or auto burglary,” Gonzalez said. But the message should stick in the minds of Brownsville residents longer than just through the holiday season. “Try to be proactive year-round,” Gonzalez said. The Brownsville Police Department is also providing home burglary prevention tips for residents. Authorities are reminding residents to secure all doors and windows, to make sure alarms is properly installed and functioning, to consider using video cameras as a deterrent, use interior and exterior lighting, decrease the visibility of valuables, keep plants and shrubs trimmed around entrances and windows, don’t share vacation plans on social media and if a vacation is in the plans, stop deliveries so that an overflowing mailbox and uncollected newspapers don’t attract thieves.